Manufactured by the W.W. Kimball Company of Chicago, the second largest producer of theatre organs, the instrument at Dickinson High School is internationally recognized as a premier instrument. Originally constructed in 1928 for the Boyd Theater in Philadelphia, PA, and heard for years over local radio station WCAU, the instrument fell silent by 1940. 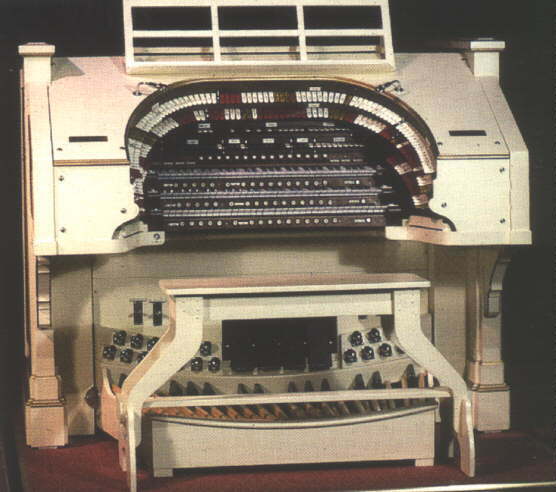 After donation to Dickinson High School in Wilmington, Delaware in 1968, the organ began a transformation that would see it recognized as a highly versatile instrument and the largest of its kind in a public facility. 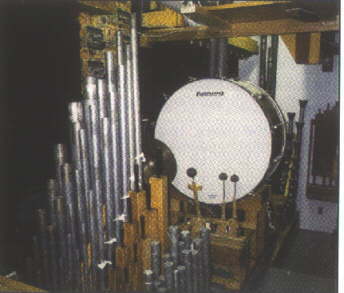 Controlled from either of two 3-keyboard consoles, the Dickinson Kimball is routinely featured in solo performance by internationally recognized organists. It has accompanied choirs, concertized with orchestras, marched with bands, routinely provides the musical score for The Nutcracker ballet in December, and occasionally accompanies silent films. The music of the Dickinson Kimball has reached the ears of millions through radio and television broadcasts and through worldwide sale of records, tapes and CDs. One internationally acclaimed organist perhaps summarized the vast resources of the Kimball best when he commented, "This particular instrument is so versatile that there is no music it can't perform, and the quality of that performance will solely depend on the abilities and imagination of the organist." Seated in the 1200 seat auditorium, you will experience the feeling and emotion of the music as the room comes alive with sound. No number of amplifiers and speakers, and only a great orchestra and a military band will equal the diverse resources of the Dickinson Kimball Theatre Organ. The Dickinson Kimball enjoys a reputation of international acclaim. 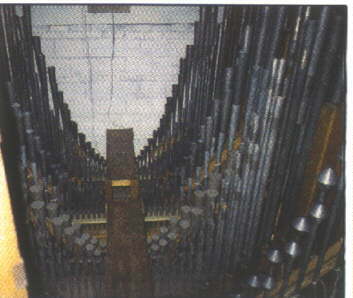 Containing 66 sets of pipes (4,393 pipes, ranging from pencil size to over 32 feet long), the organ at Dickinson can imitate the sounds of common orchestral and band instruments, including woodwinds, strings, and brass. From the rich sounds of the string bass to the shimmer of the violin, the Dickinson Kimball offers one of the most complete collections of string sounds anywhere. If your musical taste prefers brass, the Dickinson Kimball has all the brass necessary for a Sousa March, or to take you back to the Big Band Era. For those that enjoy the whisper of the woodwinds performing a Hollywood or Broadway hit, the Dickinson Kimball's vast array of flutes and orchestral voices will more than satisfy your appetite. The instrument's selection of tuned percussions includes a xylophone, marimba, celesta, and glockenspiel, as well as less common percussions such as tuned sleigh bells and a vibraharp. Keep the beat with an accompaniment of drums, cymbals, castanets, wood blocks, and triangles. Drawing from its silent film heritage, a full array of sound effects is included to produce the sounds of car, boat, and train horns, police whistles, fire and circus sirens, door knocks and bells, not to mention birds chirping, thunder and the wind. With the Dickinson Kimball's vast palette of tonal color, and the artistry of the performers, you'll rarely hear the same sound twice. The Dickinson Kimball- a definitive Unit Orchestra! 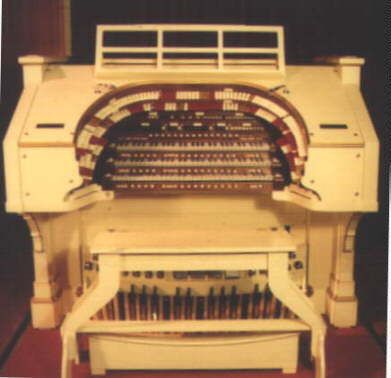 The Dickinson Theatre Organ Society, Incorporated (DTOS) was formed as a tax-exempt, non-profit corporation under IRS code 501 (c)(3) with responsibility for preserving and maintaining the historic Dickinson Kimball as well as promoting America's Theatre Organ heritage. All proceeds from concert events, recordings, and other fund raising activities are used to maintain and enhance the instrument. 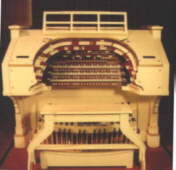 The Dickinson Theatre Organ Society enjoys a world-class reputation for premier performances presented on an internationally acclaimed instrument. Each season, in addition to the concert series featuring the finest theatre organists in the world, DTOS plans other functions including daytime concerts, occasional trips, open houses, banquets and picnics. With the Society's assistance, the instrument is often used by other organizations to accompany productions being staged in the auditorium. 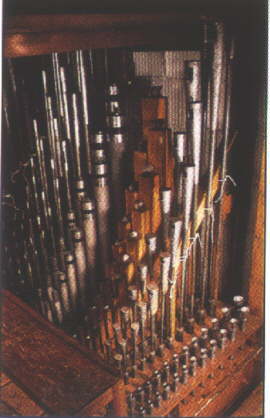 Many of the worlds best theatre organists have recorded the Dickinson Kimball and current theaer organ music is available through the DTOS Music Shop. DTOW publishes a newsletter, The Vox Humana, providing the latest news, concert information and society activities. First year complementary subscriptions to the newsletter are available upon request. E-MAIL Bob Dilworth, President, DTOS,Inc.